AMD Tenerife to deliver 20% performance boost in Q3 2012? 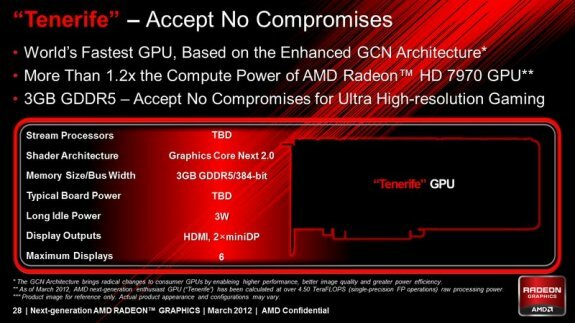 TechPowerUp came across a slide that reveals AMD's "Tenerife", a new GPU that is rumored to succeed "Tahiti" in Q3 2012 (or later). According to the leaked details, the chip will offer 20 percent higher performance than the current architecture. The slide mentions "Tenerife" as being based on "Enhanced Graphics CoreNext" architecture, probably a tweaked-up GCN, which will probably characterize "Sea Islands" family. Enhanced GCN is mentioned as having 20% higher performance over the current architecture. The next most interesting bit is the mention of a tentative launch, mentioned as Q3-2012, at the earliest. This falls in line with speculation of Radeon HD 8000 series making it to the market no later than this year. The question here is could "Tenerife" be the GPU AMD builds its "Radeon HD 8900" series on, or could AMD do a "Radeon HD X1900" by surprising the high-end segment with a new GPU in the current series? "Tenerife" is probably named after the biggest of the Canary Islands, Spanish offshore territory.